Federal officials will have the right to walk into Canadian workplaces without a warrant as part of a tightening of the controversial foreign temporary workers program. Changes to immigration and refugee protection regulations, published just days ago, give Human Resources and Skills Development Canada officials or Citizenship and Immigration Canada officers the right to walk in on businesses as part of a random audit or because they suspect fraud. Upon entering a property, officials will have wide powers of investigation. They will be able to “examine anything on the premises,” question employers and staff, request documents, use photocopiers to copy records, and take photographs or make video and audio recordings. 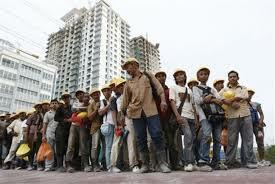 They will, however, require a warrant if the property where foreign workers are employed is a private dwelling. The new regulations come just months after the Conservative government reversed course on the temporary foreign worker program with measures to make it tougher, and less economically attractive, to import short-term labour. Hundreds of thousands of foreign workers came to Canada in 2011 – more than double the levels of a decade ago. Richard Kurland, a Vancouver-based immigration lawyer who has practised for more than 25 years, said this measure presents a new risk for the tens of thousands of Canadian businesses who use temporary foreign workers. “This is a civil liberties grab,” he said, adding he has spent the past two days advising companies on the threat to their business records. Federal officials said Monday these new warrantless inspection powers stem from changes set into motion one year ago in the 2012 budget. “Show me in the budget where they said ‘warrantless search and seizure.’ Because I can’t find it,” Mr. Kurland said. Before this, Ottawa had relatively limited tools to ensure employers are complying, government officials said. Mr. Kurland said businesses risk having commercially sensitive information carried off their premises by Ottawa. “Unless the property is a dwelling-house, no person has a right to object to that use of the property and no warrant is required to enter on or pass through the property,” the rules say. “The message to business is that if you hire a foreign worker we reserve the right to, without a warrant, search and seize anything we find within your business that may be connected to information concerning foreign workers,” Mr. Kurland said. On-site inspections will be triggered three ways: a government officer or the Minister of Human Resources and Skills Development suspects an employer is not complying with the rules; the employer has previously broken the rules or the business was chosen as part of a random audit.